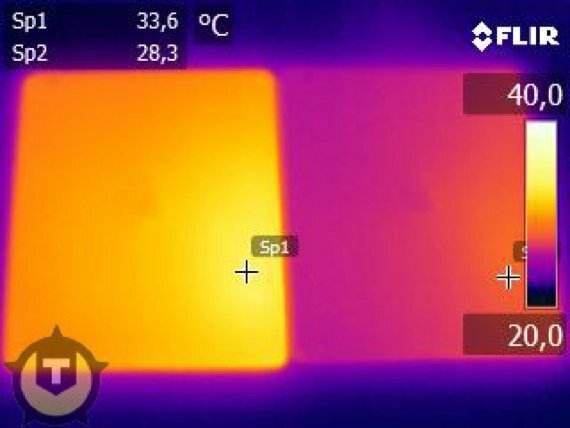 The Register reports thermal camera imagery confirms that Apple's new iPad runs hotter than the iPad 2. The hottest zone seems to be the bit you hold in your left hand, this is where the battery is located, but at this point its unknown whether it's a case of the battery getting hot, or how the iPad's casing routes heat away from the CPU. The guys over at Dutch-language site Tweakers.net took an infrared camera and snapped the tablets alongside each other. Both iPads were set running GLBenchmark to thrash their CPUs, and after five minutes the team took the following snap. The new iPad is on the left. The temperature at the lower right corner of the rear - the bit you hold in your left hand - was recorded to be 33.6°C. The same place on the iPad 2 reached 28.3°C, just over five degrees lower.